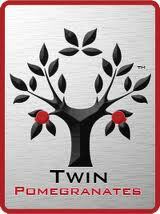 Twin Pomegranates is a small wine company located in Fresno, California. They are quite unique in their wine format--they use locally grown super-fruit Wonderful Pomegranates as the base of their wine, therefore crafting wine that contains rare, exotic and unique flavors and qualities. 100% Pomegranate Table Wine--Approx 13.4% Alcohol, Tart, Crisp, Bold, Dry taste with the distinct nose of Fresh Pomegranate. Pomegranate & White Wine (Chardonnay) Blend-- Approx 12.9% Alcohol, Clean, Light, Chardonnay with a subtle Pomegranate finish with the nose of apricot and green apple. I was able to sample Twin Pomegranates' Table Wine and their Sparkling Wine. First, if you have ever tasted a pomegranate or 100% pure pomegranate juice than you know not to expect the sweetness that you might from other fruit wines. To me pomegranates have a very unique and distinct flavor that I could completely taste in both of these wines. If you are a Champagne or drier Sparkling Wine fan--I think you will really enjoy the unique flavors of their 100% Pomegranate Sparkling Wine, if you prefer your Champagne in a "Champagne Cocktail" (I admit I fall into this category) this wine will add a unique and quite enjoyable twist to your traditional varieties, like a Mimosa or Bellini--the pomegranate flavors and fragrances sort of adds another dimension. Of the two, I preferred their 100% Pomegranate Table Wine, I could definitely notice the pomegranate flavors and fragrances--it had the tartness & dryness that pomegranate juice has. While I was drinking it, I was thinking that this would make an awesome sangria or wine spritzer for those who do not prefer dry wines, plus I bet this would add some really unique flavors when used in cooking---I am think poultry, pork or mushrooms maybe. I just may have to experiment a bit! Twin Pomegranates Wine carries the unique qualities and flavors of the Wonderful Pomegranates that they are made from. They can be found in some Whole Foods Markets and in a few stores primarily on the west coast (CA & NV) but they can also be ordered online. If you enjoy pomegranates and drier wines--these pomegranate wines would be a match made in heaven for you! Enjoy--preferably at least a bit chilled in my opinion! And please enjoy responsibly. Right now you can get FREE shipping on your order when you use the code BLOG. Thank you to Twin Pomegranates Wine for my sample used in this review, opinions are honest, review by Michelle.